Some of my readers may not know that I am also a regular contributor to Walla Walla Lifestyles, a magazine about the valley's people, wine and food. It is distributed 11 times a year through subscription with the Walla Walla Union Bulletin. The following article is from the July 2011 issue. The title sounds so romantic, right? Unfortunately, it comes from a melancholy black-and-white movie from 1962 about an alcoholic man who falls in love with a young woman. She, however, unlike him, prefers chocolate over alcohol. Of course, they get married. He assists her in her own upcoming addiction to alcohol so they can share his addiction. 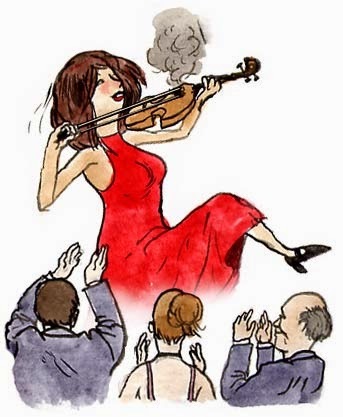 And, wouldn’t you know, he beats his addiction, she doesn’t, and he leaves her. The End. The movie’s title is an odd one, because the alcoholic protagonists don’t even drink any wine. Liquor, such as gin and vodka, is more to their liking. I have my own “Days of Wine and Roses,” but they are nothing like the movie. My days of wine and roses are spent out on my back deck during the summer. It’s a quiet place where I can sit in one of two rocking chairs I purchased during a visit to Tennessee. These oak chairs were handcrafted by a family who has been making rockers for 150 years. Between the two chairs is an old Hungarian oak wine barrel. On the head of the barrel, I have placed a large, round, glass top. It makes the perfect prop for my afternoon glass of iced tea, evening glass of wine and, often, my morning cup of coffee. On the deck is an assortment of pottery and antique cement pots that are usually filled with summer annuals and herbs. There’s a birdhouse that has actually housed a few nests, and a delicate-sounding wind chime. The best part is below the deck. It’s framed with a colored assortment of rose bushes and the fragrance of the roses wafts up to the deck. Unfortunately, an early freeze struck last November, and this spring when the roses began showing some bud break, we received another cold snap. Out of my 18 rose bushes, seven were given over to merciless Jack Frost​. As I sat in my outdoor rocking chair, mourning my roses and looking at the lifeless, thorny gray sticks poking out of the ground, it suddenly became overwhelming to me. Everything that week became overwhelming from simple chores like rinsing a cereal bowl to reading a sentence and trying to make sense of it. It dawned on me that I hadn’t taken a vacation in a couple of years. The last few years of my life had met with some losses and, at the same time, some intense excitement and life-changing experiences. I had to get away! And I did, and started writing these sentences about wine and roses in a cabin tucked away in the mountains of Oregon. It wasn’t too far from civilization, as there were other cabins close by, but they were also filled with other adults who, I imagine, were looking for the same thing I was looking for: peace and solace from nature. There was no cell service, but plenty of fresh mountain air and a few friendly deer. Most of all, it was quiet. The noisiest thing around me was the humming refrigerator in the cabin’s kitchen and the occasional sigh from my patient little dog, Chloe. This time made me reflect on people who had made a difference to me in the last 14 years of my life and, in fact, had even changed the path of my life. Of course, I also thought of my roses — or the lack of them. 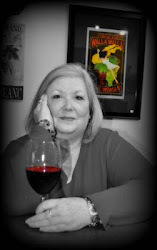 I started thinking about my former wine instructor, the late Stan Clarke, and how he made such a difference in my life. I remember a classroom discussion about vineyards, whether they were in Washington, California or even in Europe, and how there would sometimes be beautiful rose bushes planted at the end of vineyard rows. Stan pointed out that the roses were there for more than just aesthetic reasons — roses and grapevines are susceptible to the same diseases. Vineyard owners in Bordeaux discovered centuries ago that roses and grapevines have a lot in common. Roses act as beautiful and fragrant sentinels for the grapevines as they can display early warning signs of powdery mildew, a fungal disease that affects the growth of fruit and causes the vines to rot eventually. Roses are more sensitive than grapevines, so, if a vigneron notices his roses have this fungus, he knows it is time to treat the vines to prevent them from getting the same disease. Roses are also homes to beneficial insects such as ladybugs that feast on aphids and other undesirable insects. Not just the roses told the story of the November freeze and the cold spring — so did acres of grapevines. The Walla Walla Valley experienced some of the coldest temperatures around the state, and many of the lower-valley vineyards suffered the most, sustaining damages of about 20 percent, with some grape varietals being damaged as much as 100 percent. Still, as they often are, winemakers are feeling optimistic about the 2011 vintage. After four days of cabin-living, I came home feeling rested. I was able to jot down few words during my stay, but I read through a magazine and a book and was able to comprehend all of the words. I went out to my deck and peered down at my slow-blooming roses and noticed three of the seven bushes I had declared dead were showing signs of green, and young, new, red leaves were gloriously popping up from the earth. 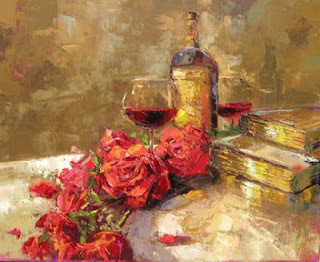 The sun was shining and birds were singing — once again, I would have my days of wine and roses. A few months ago, Gilles Nicault, general winemaker for Long Shadows Winery asked me, "Do you remember Dazzle? It's coming back." Oh my yes, how I remembered "Dazzle." Dazzle was a project of Long Shadow's back in 2003, shortly after they first opened their doors. It was a project that was never released - - at least not through Long Shadow's. Due to labeling issues Dazzle, a brilliant red syrah rosé packaged in a clear bowling pin shaped bottle with a gold foil-like label, was scrapped for Long Shadows. I remember Gilles gifting me a few bottles of Dazzle with the original label (I think I may still have one tucked away). Fortunately, the orphan bottles of Dazzle were kept in "the family." Marie-Eve Gilla, winemaker and partner of Forgeron Cellars is also married to Gilles. Forgeron was able to purchase the wine and relabel it appropriately by COLA (Certificate of Label Approval). At the time (seven years ago) it was a huge undertaking to sell a rosé to a population of domestic wine drinkers who were still under the mind-set that it was going to be comparable to a "California Blush." I know this first-hand as I was one of the sales staff at Forgeron Cellars at the time. The tough part was getting the public to try it. Once they did - - sold ! My key sales words? "French-style" "Made by a French winemaker" and "Scrap the Pinot Noir. Get bold and pair it with your Thanksgiving turkey." Needless to say the pretty dark pink liquid "flew" out the doors. Winemaker Gilles Nicault has a gift for making rosé. It would make perfect sense when you consider he gathered some of his winemaking craft in vineyards and wineries of Provence. Provence, the site of France's oldest vineyards, is the only place in the world that really specializes in rosé. Rosé has been the focus of Provence winemaking for centuries ever since the Greeks brought wine to the area in 600 BC, the people of Provence have been perfecting the art of dry rosé production. I can remember back when Gilles first came to the valley and was a winemaker at Woodward Canyon Winery back in the late 1990's. Every opportunity I could get I would rush to Woodward Canyon's Spring Release, especially if I knew they had just released a rosé. Yes, Dazzle is back. "Juliette's Dazzle" is a special project of Allen Shoup, CEO and founder of Long Shadows Winery and named the wine after his 11-year old granddaughter, Julia. You won't find this rosé at the winery, either. It was produced especially for wine shops and restaurants under the "Dolan & Weiss" label, which also has a family connection. This clear red rosé is produced from Pinot Gris, a grayish pink grape which is classified as "white." The pinot gris was lightly mascerated and fermented like a red wine on its skins, giving the wine it's sole source of color as in traditional Provence rosés. However, Gilles added 3% sangiovese to add more fruitiness and to enhance the vibrant color. This luxurious liquid has not touched a hint of oak. This is truly an elegant "porch sipping" wine for those lazy afternoons or cool summer evenings. There is 1.4% residual sugar, which has also given the wine a natural "spritz" making it fresh and bright with every sip. There are enough crisp acids in the wine, like a riesling, to keep the natural fruit sugars balanced without being cloying. The packaging is beautiful and would make a wonderful wine for entertaining during these summer months. Also, "Scrap the Pinot Noir. Get bold and pair it with your Thanksgiving turkey," that is if you can keep it around that long. Juliette's Dazzle would compliment fruit salads, lemon bars, fruit pies, rich and creamy cheeses, Asian-influenced dishes, as well as delicate chicken and seafood dishes. Also keep the bottle and use it as a summertime patio vase for your posies and roses from the garden. Sante! Chenin Blanc is a white grape with origins from the Loire Valley of France. It is known for it's high acidity and because of the acidity, it is the very reason why I think it makes such a perfect wine for summer and especially paired with foods year 'round. 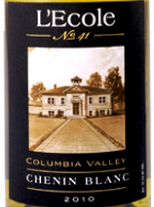 Chenin Blanc is not a wine that you see a lot of around the state of Washington, however there has been one winery in the state who has been consistent with producing this lovely light and refreshing wine from almost the day they first opened their doors. L’Ecole Nº 41 has produced this old vine, "Vouvray" style (more "off-dry") Chenin Blanc since 1987. Jean Ferguson, L’Ecole Nº 41’s founder and winemaker, loved this wine and crafted her version of Vouvray through cold fermentation to enhance the fruity and floral esters. Not only does L'Ecole have a long history in Washington with Chenin Blanc, but the grapes they source for their Chenin Blanc also has a history as the Willard Family Farms of Rattle Snake Hills AVA near Prosser and the Phil Church Vineyard of the Yakima Valley AVA near Sunnyside, were both planted in 1979. To describe sipping on the 2010 L’Ecole Nº 41 Chenin Blanc, think thirst-quenching. Kind of like a "adult" lemonade with floral notes. The acids in this wine are vibrant along with flavors of orchard fruit such as crisp Granny Smith apples and fresh picked apricots. Notes of sweet and mild ruby red grapefruit leaves a pucker here and there while still leaving a very light sweet finish, never cloying, in your mouth. And the nose is something you would like to dab behind your ear with influences of the exotic such as Asian pear, honeysuckle and orange blossoms. It's truly a wine to quench your thirst during these warm summer days and to continue sipping in the cool evenings paired with food such as with spicy Thai, seafood fajitas, Jerk chicken and summer salads, including fresh fruit salads. Sante!